Summary: The excess of colourful CG becomes sickly, like being force-fed Haribo until you throw up. Sam Raimi has described his take on L. Frank Baum’s stories as a “love poem” to 1939’s masterful The Wizard of Oz. If it’s a poem, it’s a poem only in the way a McDonalds slogan or a Justin Bieber song can be called a poem. 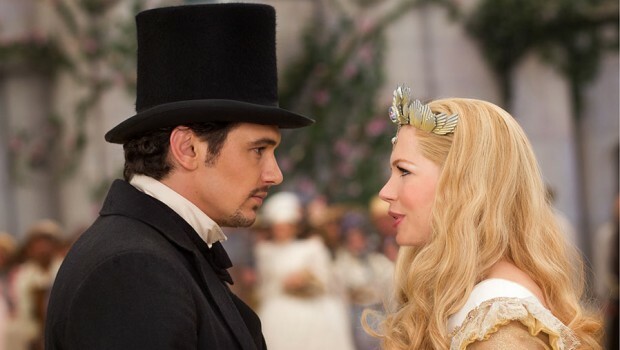 Creatively-starved, bland and mind-wipingly forgettable, the film it most closely resembles is 2010’s Alice in Wonderland – which, bearing in mind the hefty box office take of that movie in the wake of critical indifference, is presumably the point. Oz isn’t really a Sam Raimi film in the way that Alice in Wonderland wasn’t a Tim Burton film. It’s a £300 million Disney film, with Raimi just one of many replaceable cogs in a cold, calculating machine. Every idea and every line feels like it’s been signed off by a boardroom of corporate suits, leaving a film that feels enervated, lacking anything in the way of magic, wonder or surprise – a long way from the halcyon days when Disney could turn out one timeless fairytale after another. James Franco has given some towering performances over the years in everything from Freaks and Geeks to 127 Hours. His fraudulent, womanising wizard Oscar Diggs (or Oz) is hardly on the same level, but it’s the best thing about the film, and Franco turns the character into a charming, Han Solo-esque rogue – though by the time he’s on his way to full-on character redemption, he’s far less interesting. The film is at its strongest in the gently amusing, black-and-white opening 15 minutes set within a low-key circus in the 1880s, which sees Oscar and his associates perform magic tricks in front of an audience that alternates between wonder and doubt. Once a tornado whisks Oz off to the land that shares his name, there is one neat device – as well as exploding into colour, the aspect ratio changes from 4:3 to widescreen – but aside from that, it’s downhill all the way down the Yellow Brick road. None of the other characters Oscar comes across in this fantastic new world are interesting or particularly likeable. There’s a trio of witches – Glinda (Michelle Williams, suitably nice but bland), Evanora (Rachel Weisz, in pantomime mode) and Theodora (Mila Kunis, who is given the only other character arc aside from Oz, and looks fetching in a hat). There is a horrible comedy monkey sidekick voiced by Zach Braff. And there is an even more horrible sentimental china doll, voiced by Joey King, who whines through most of the picture. As with Alice in Wonderland, the excess of colourful 3D CG is overbearing: it becomes sickly rather than awe-inspiring, like being force-fed Haribo until you throw up. It’s in stark contrast to the lovingly crafted practical effects of The Wizard of Oz and 1985’s gloriously dark sequel Return to Oz, both of which remain visually superior, despite the millions ploughed into the set design and effects of the new film. It’s not the effects that sink Oz, however – it’s the tone. Lurching from post-Shrek irony (everything from the ridiculous Munchkins to the transformation of one character into the Wicked Witch of the West is played for nudge-nudge parody, with the latter plot twist unconvincing and overplayed) to craw-sticking sentiment (mostly, though not exclusively, centering around China Girl), it doesn’t feel like anyone involved is taking this seriously – so why should we? Of course, this is a children’s movie, and kids might enjoy the bright colours, the zippy, predictable plotting and cute sidekicks. But Raimi’s film just doesn’t have the staying power of The Wizard of Oz or Return to Oz – movies which were truly great and powerful.